Hilly terrain with some woods, orchards and fields, and good visibility. 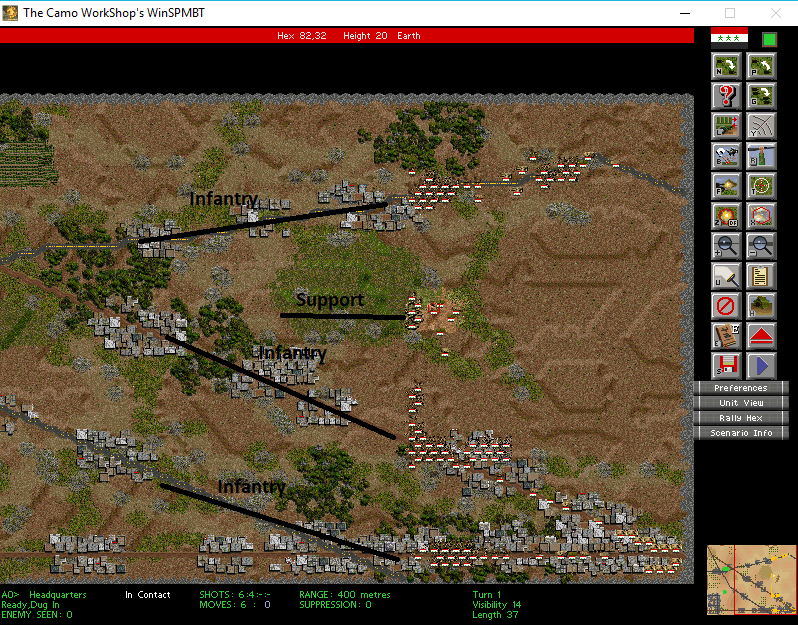 The 100+ hills are all on the American side of the map, overlooking the valley where the scattered VPs are located. The big question will be how well defended are the hills that form the eastern side of the valley, marked with the straight line. No VPs there, and the hills should provide enough of a LOS break to permit approach, even if there are observers on the 100+ height hills... Due to the spread of the VPs, the Marauders will spread out and probe for weaknesses. I don't want to use the roads too much, but the fields slow down ground troops so much that I will strive to avoid them whenever possible. Already first blood is drawn. A Dragon team takes out my BTR, but is itself destroyed by a HMG. Other than that, Marauders advance without opposition. The northern advance encounters a MMG section with two MMGs. It is well positioned to cover the road, but is itself vulnerable to the Scout section that has a sniper rifle. The Americans cause the first casualties, but eventually that sniper rifle disposes of them. 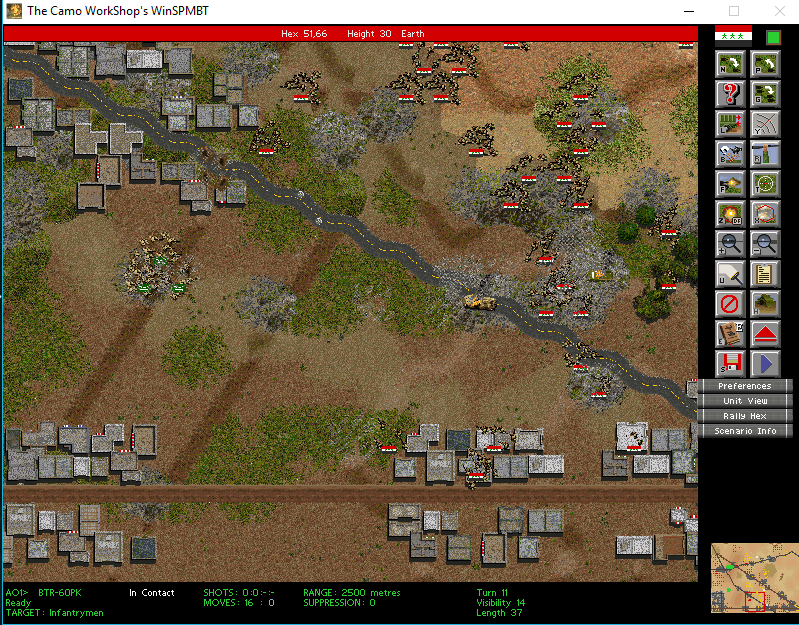 The center advance along the SE-NW road encounters a full enemy platoon. 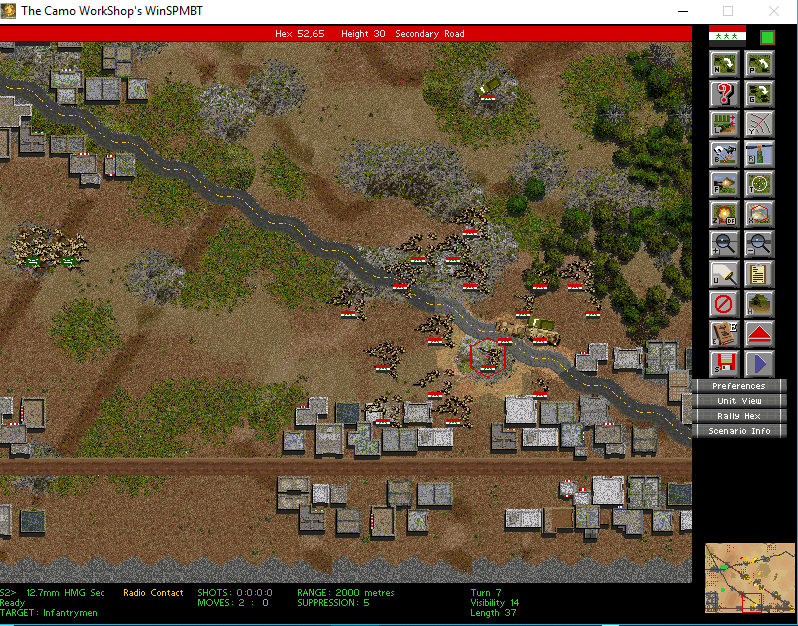 A proper infantry-only firefight ensues, as the mortar fire called in blind by Lt. Col. Mustafa succeeds only in barely suppressing the enemy infantry. 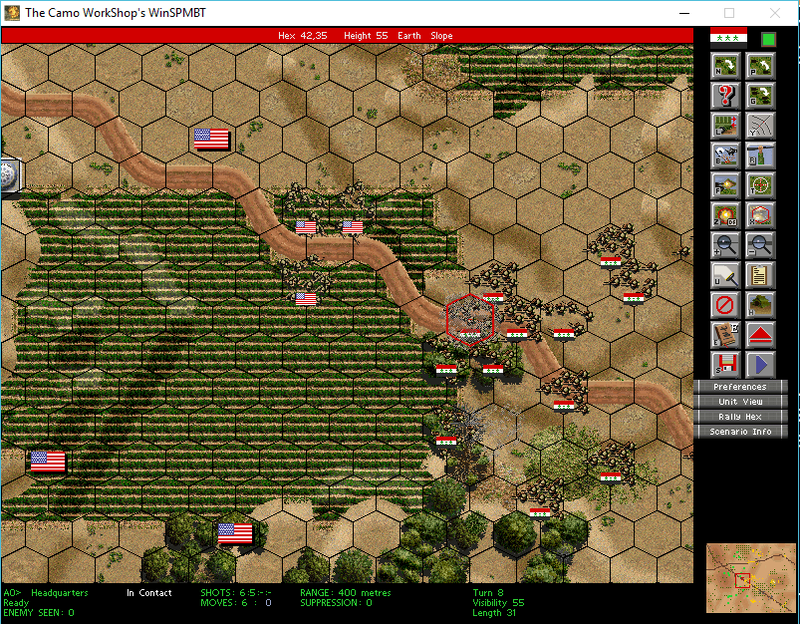 Armed with an MG and a GL per section, the U.S. Army troops inflict casualties, but I expect that the weight of two full companies will overwhelm this force. 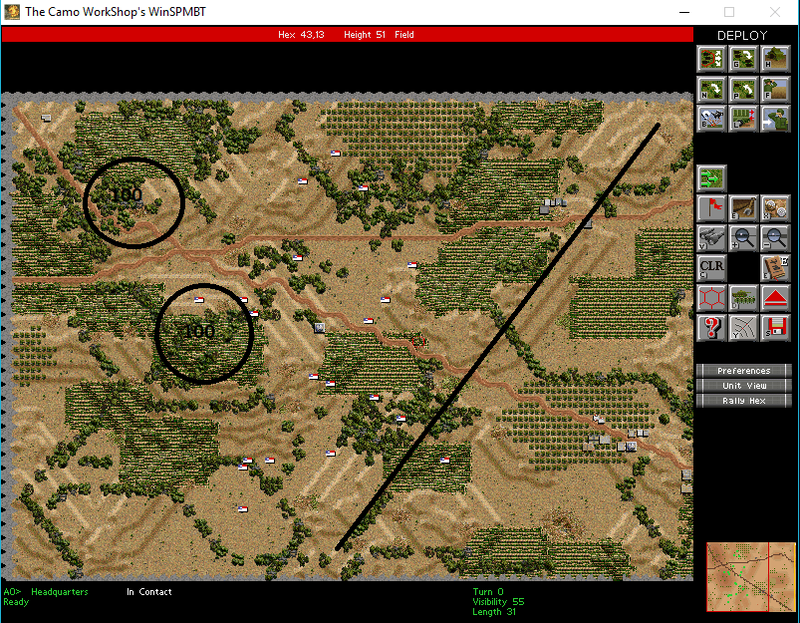 Indeed, the central advance routed the platoon in front of it, due to a combination of overwhelming numbers and fortuitous mortar bombardment. 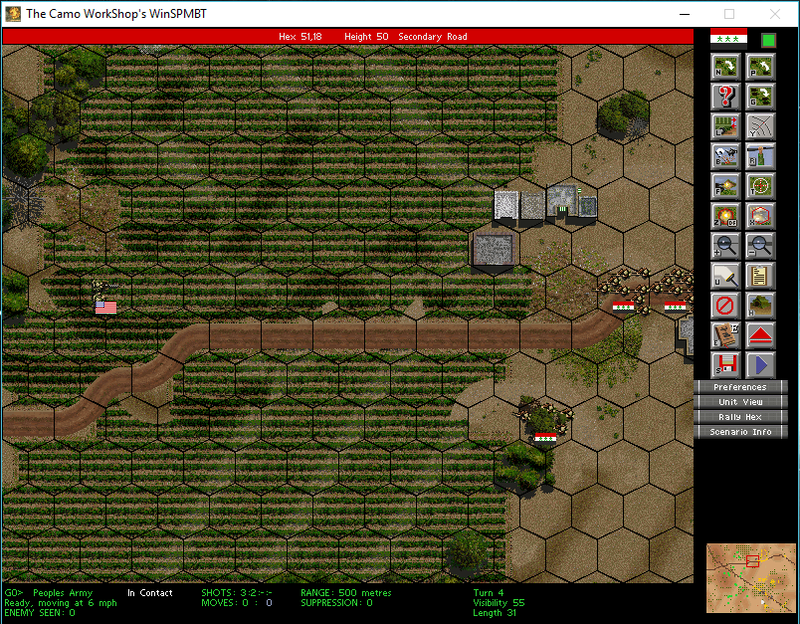 On the same turn, however, the northernmost company ran into its own opposition, with another 2xMMG section and what is most likely a full platoon hidden in an orchard. 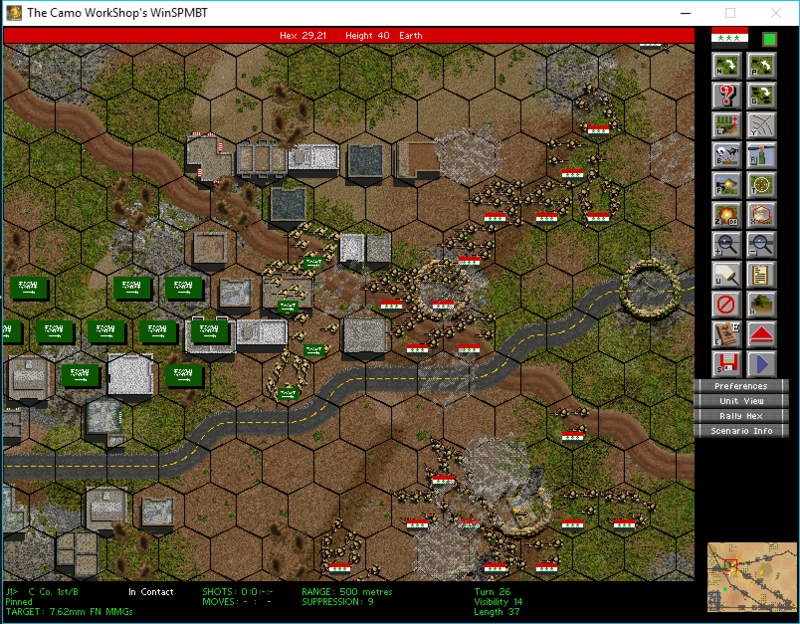 There is still at least one Dragoon team at large, which means that basically none of my vehicles have moved since the loss of the BTR on Turn 1. Just to the south of this skirmish, however, another Marauder company is advancing along the road without further opposition, and should begin to capture VPs in the next few turns. Some of the northern American troops were within range of the small "fire base" set up around the HQ unit on a 80-elevation hill. With the range of 2,500m, the AAMGs are particularly useful. 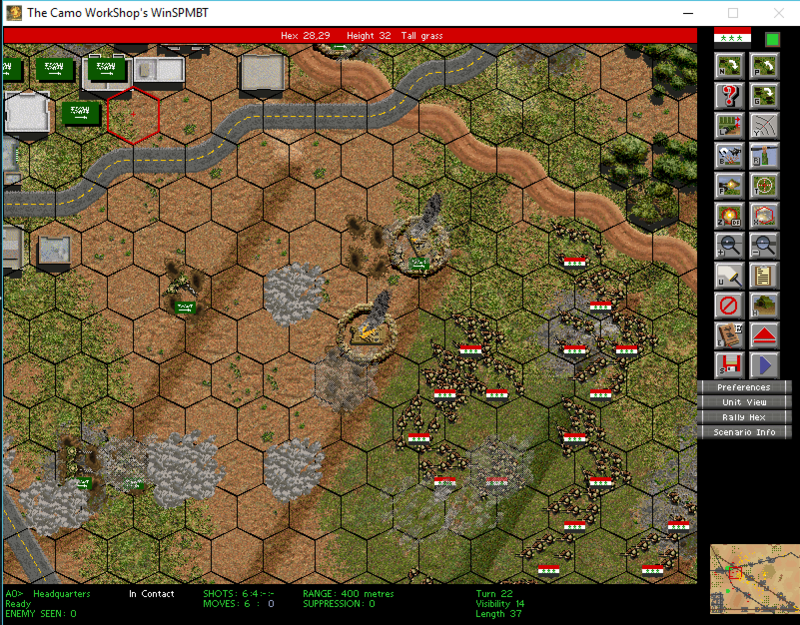 Even with fire support, the northern advance is slow going. The Americans have at least two platoons of infantry hidden in the orchard, plus Dragons and at least one MMG section. A Company is being ground to bits slowly but surely and cannot sustain their frontal advance without losing units. Most squads have 2-4 casualties already. 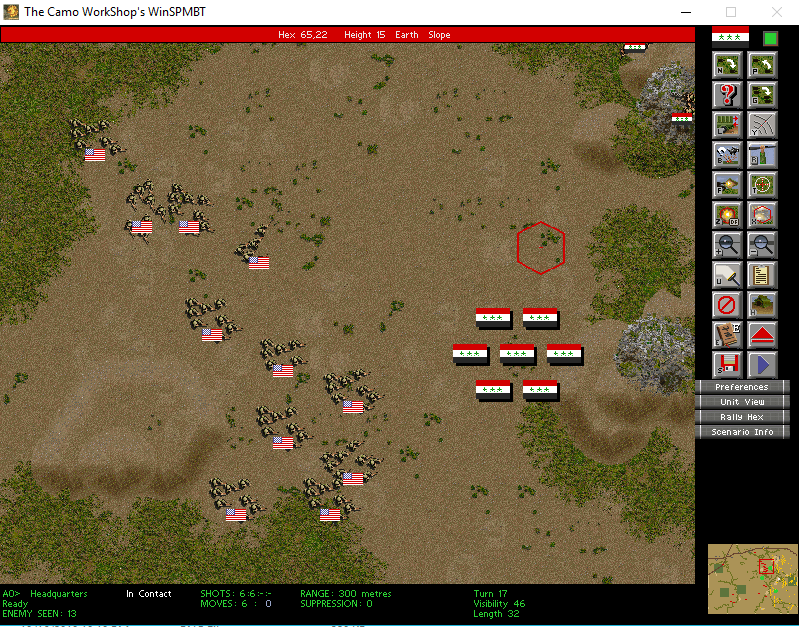 Z-fire from support units is providing some help, but there are simply too many American units to suppress. At least one people's army company will need to be diverted to the northern orchard. In the south comparatively little happens, with the southernmost company encountering their first resistance, but the extent of that resistance is not yet known. And what a difference a turn makes... Americans had close to a company of infantry hidden in the northern orchard, and that company is now breaking out to try and re-capture some of the VPs. My troops are fairly spread out, trying to reach the scattered VPs, so the next few turns will require consolidation and careful action to preserve the troops. 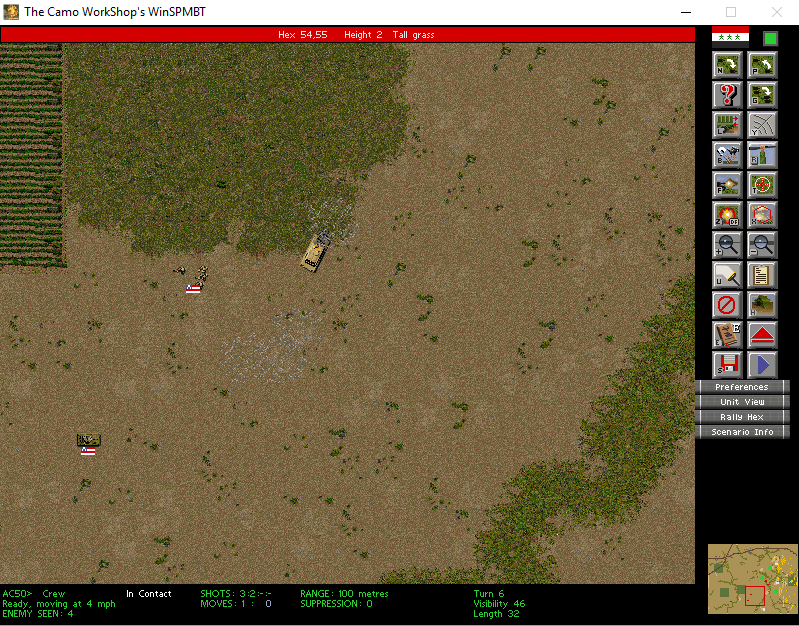 The enemy advance is protected from indirect fire by the slope of the hill, so this will be close infantry combat. The good news is that the southernmost American troops are also on the move, so the company advancing in that area will be hitting moving troops, and not hidden stationary ones. 0. The first rule is that the rule for excessive casualties (resulting in a demotion) is checked before the rule for promotion. The same unit cannot be demoted and then promoted after the same battle. 1. A unit with 60 experience is eligible for promotion to a different type of militia unit - gives access to PPSh-1 submachine guns, molotovs, shotguns, and firebombs - primitive or older weapons. 2. A unit with 70 experience is eligible for promotion to a second-line infantry type unit, which may be equipped with Western weapons, to model the fact that Marauders now have access to a considerable amount of western equipment. Ammo for these weapons is reduced, per the suggestions above. 3. A unit with 80 experience is eligible for promotion to a first-line infantry unit, which again may have Western weapons. It may also be an Iraqi engineer squad, for example. Sufficient Marauders have perished to mines, and sufficient Western engineers have been defeated, such that one or two engineer squads could be fielded. 4. Should any unit reach 90 experience, it can become elite. At this point, it can be promoted to an elite-type Iraqi unit, or a modified unit (with Western Terminator-tier weapons). The Mountain platoon is "grandfathered" into this rule (meaning no demotions of Mountaineers if less than 90 experience), but if any Mountaineer unit is excessively damaged/eliminated, it has to be demoted/start over as a People's Army squad. 5. Any non-heavy-weapon Marauder unit that is lost in battle must start over as a basic People's Army squad, learning the ropes with nothing more than a Mosin or AK-47 and a few grenades. This includes scouts and the Mountain platoon. Snipers start over as mere sharpshooters, and will progress within their own hierarchy, already provided in the basic OOB. 6. Any non-heavy-weapon Marauder unit that loses 50%+ of its complement is reduced in rank by one, to reflect the fact that the Marauders replenish their forces from the available manpower - perhaps there are some Iraqi military stragglers around, but most of the time the only recruits available are completely raw young men. Therefore, a first-line infantry unit cannot simply be "repaired" - it must be replaced with a second-line infantry unit, to reflect an overall loss of experience. Replacing units carries its own in-game decrease of experience, further punishing excessive losses. 6. Heavy weapon units (grenade launchers, HMGs, mortars etc.) can be replaced as normal - loss of experience is a sufficient punishment. Additionally, I will add some "dead" points to the force. 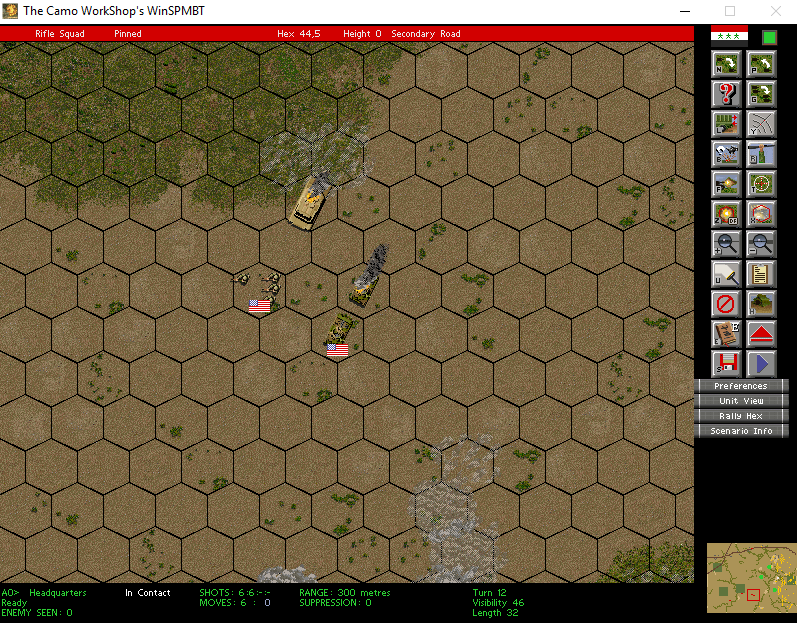 For Battle 09, I've added a company of Republican Guard tanks as support units. After this battle, I will add a permanent force of "dead" points to the core. These units will not participate in the fighting, but will boost the total force points of the Marauders, which in turn should give extra points to AI. I don't want to simply set AI points at some arbitrary figure in the Preferences, because my understanding is that the AI will then get that amount of points for EVERY battle, regardless of its posture. I do want AI strength to vary depending on mission type, and this is my workaround (suggestions welcome). There are two VP clusters, one in the North, one roughly in Center. A Southern approach along two roads is possible, and could potentially be used to flank the VP positions. A visibility of 14 means that infantry will be able to engage freely, but any units with 20+ vision will be able to act with impunity... the battlefield is dominated by two 50-height hills on the Saudi side, including one in the center that contains 2/3 of the VPs. On the Iraqi side, there is a 40-height hill that should form a good base for Marauder support weapons. An entire company of Republican Guard tanks appears on the Iraqi side, not to fight, but to boost AI points. After defeating the Americans, Col. Mustafa decided to immediately move his troops along the roads he had just cleared, without stopping for reinforcements, or to re-equip the Marauders with captured weapons. This proved a momentous decision, because without the benefit of rest and resupply, the Marauders found themselves face to face with fortified Saudi positions, with a frontal assault the only way forward. 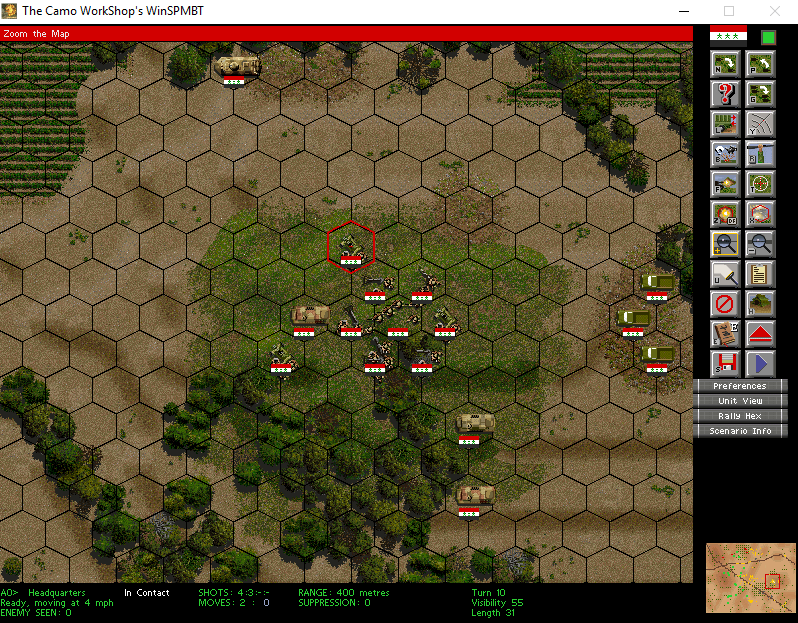 Col. Mustafa decided to split his infantry into three columns, each roughly equal to a reinforced company strength. This accounted for the fact that about two companies had suffered serious casualties in the previous battle that could not be replenished. Indeed, several Marauder squads never moved from their trenches in this battle, their numbers too low to provide any help. ... the southern advance consisted mostly of troops equipped with AK-47s, although with 20/20 hindsight it should have been Mosins. The Marauder troops found themselves under accurate fire from numerous entrenched Saudi troops, firing their MGs at 600m, compared to the 400m range of the AK-47. The only available cover were two villages - the one along the southernmost road was too far away to allow trading fire, and the one accessible via the paved was defended. Additionally, the few Marauder vehicles providing support were quickly knocked out by as-yet-unseen missile units. Col. Mustafa decides to completely abandon the southern advance, in favor of a concentrated assault on the center. The northern advance encountered no such difficulties. With only a few Sauid squads opening fire in piecemeal fashion, the Mosin-armed Peoples Army troops are able to advance at a steady clip. The souther attack is now completely abandoned. The cluster of buildings Marauders hoped to reach looks to be defended. Only a HMG and a sniper remain to keep the Saudis honest. In the center-north area, the Marauders are slowly advancing up the central hill, having identified two tracked TOW vehicles responsible for stopping the southern advance. 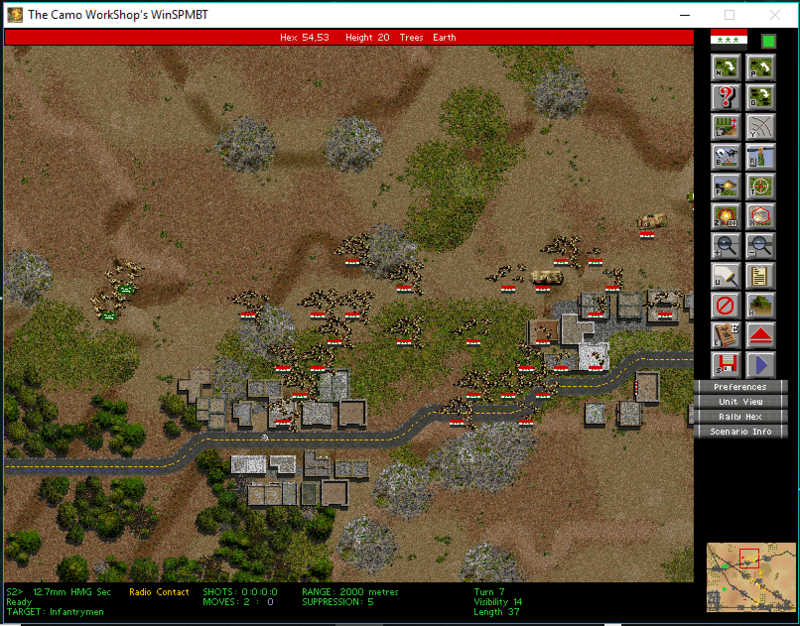 The Marauders painstakingly set up for the assault on the center hill, using available cover as they are harassed by Saudi mortars. The elite Mountain platoon knows that it will have to knock out the TOW vehicles, and the ATGs are also moving into position to engage. Because the visibility is only 700 meters, the ATGs, with sights of up to 1,000m, can set up in relative safety from Saudi infantry - but the TOW vehicles, which can see up to 2,000m, must be suppressed to allow the trucks towing the ATGs to get in position. The slow, methodical attack through the center made considerable progress. Mortars were used to provide smoke cover against Saudi MMGs - it turned out there were no fewer than 6 MMG sections defending this one slope. Z-fire through the smoke proved crucial to suppress those weapons. The Mountain platoon and the ATGs each took out a TOW vehicle - a TOW missile being useless against either infantry or a gun. 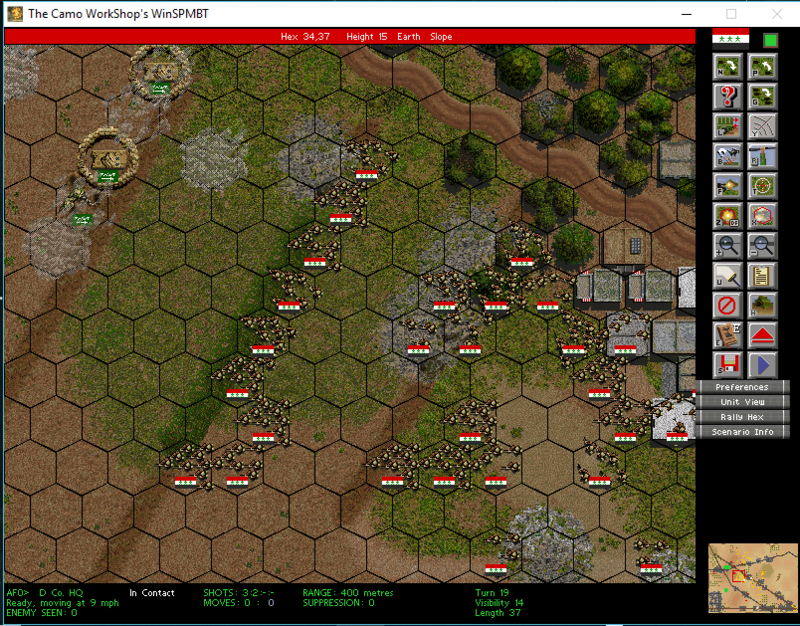 Marauders possessed the sheer numbers in this sector, so even though the MMGs, the TOW MGs, and the Saudi mortars each took their pound of flesh, there always were enough unsuppressed Marauder squads to press the advance. 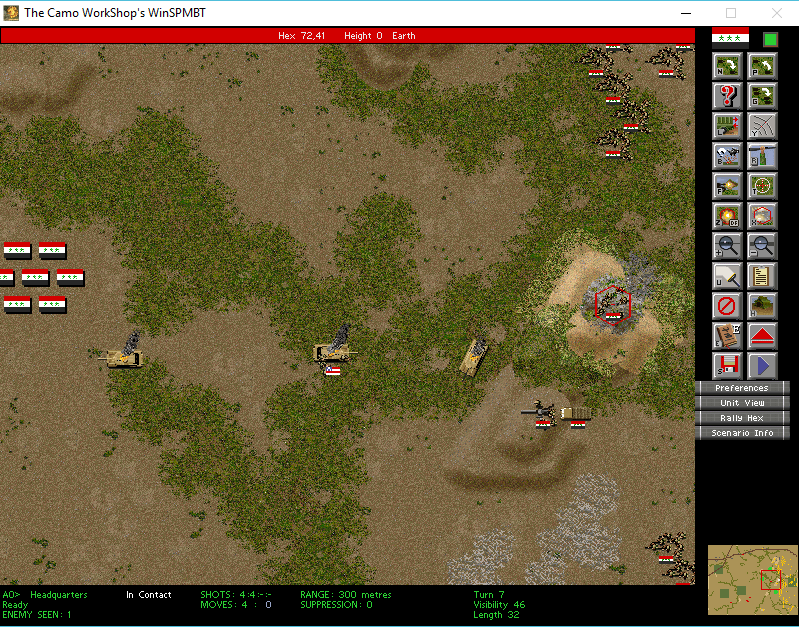 In retrospect, this was actually perfectly logical - the AI was always likely to mine the flank approaches, and defend the center with actual firepower. Lacking engineers, the Marauders' best course of action was a mass assault down the center. 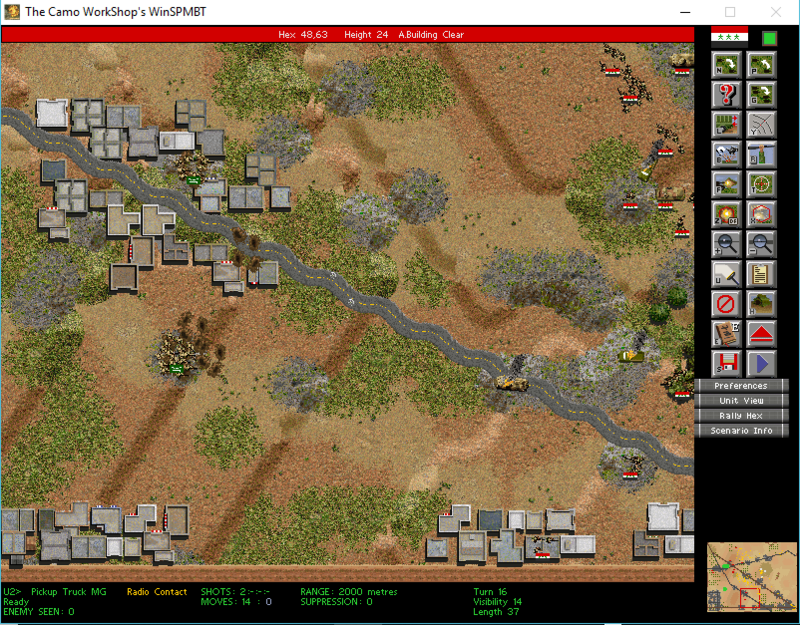 Perhaps sensing that a breakthrough was imminent, a Saudi platoon launched a counterattack in the central village, abandoning its dug-in positions. This proved a mistake. Saudi troops were engaged at close range, and made to run by experienced, if depleted, Marauder squads. 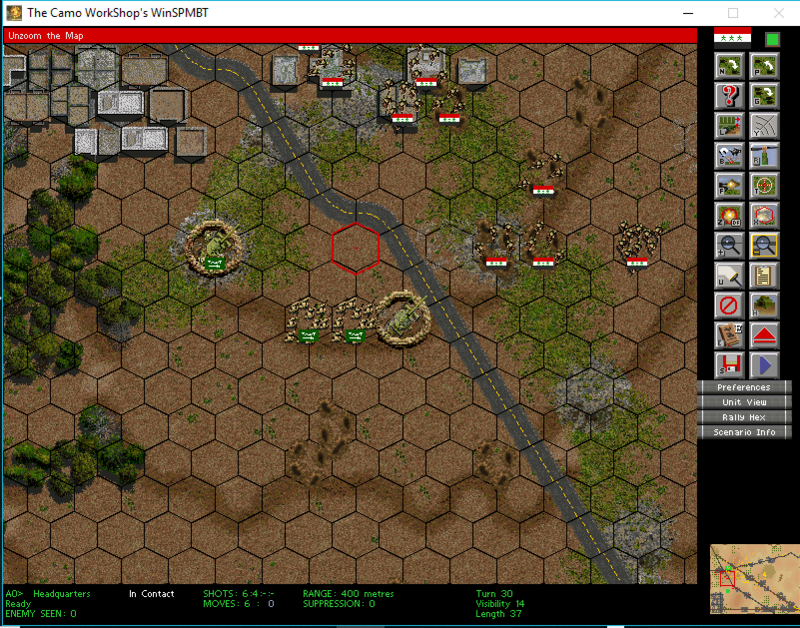 The battle for the central hill/village/VPs is not over yet, as Saudi reinforcements arrive from the south, and AA artillery opens fire on the advancing Marauder infantry. Having now been in the thick of two battles without rest and refit, some Marauder squads must hang back or risk destruction. Indeed, most units are either in imminent danger of being wiped out by one bad volley, or are at half-strength. Nevertheless, with all three attack axes now focused on the village, the Marauder numbers put paid to this threat as well. With no further protection, the Saudi VPs are captured. 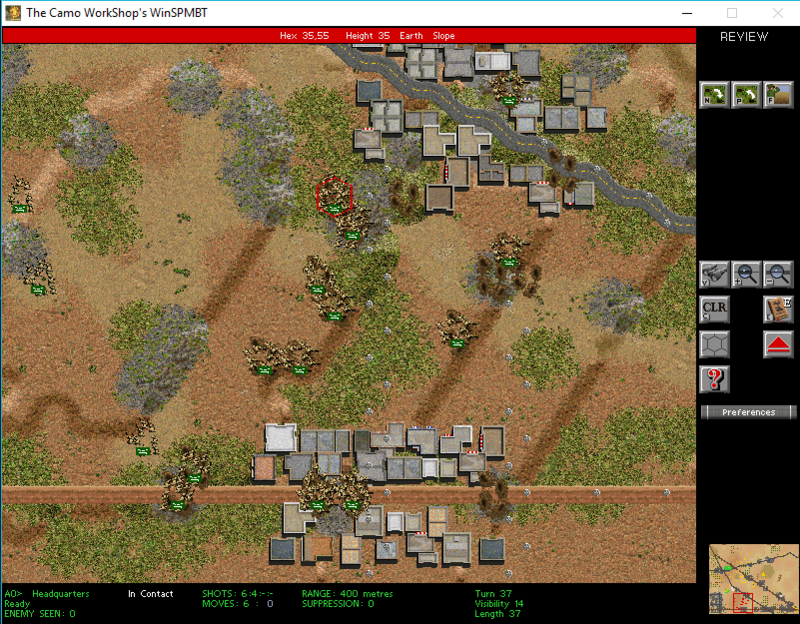 The end result of the battle was a Decisive Victory, but the interesting part was that roughly a company of Saudi infantry, set up to defend the southern approach, never left their foxholes, even when all the VPs were getting captured by the Iraqis. It is unclear to me why, although they would have had an impact in the center had they moved. As it happened, it was simply never necessary to defeat them. Of course, had the southern advance not been halted 1/5 of the way through the battle, these entrenched Saudi troops would have likely shredded my southern company, and possibly prevented a victory at all. The battle takes place in probably the best visibility conditions to-date, and it is also fought on very flat terrain, with only one east-west road in the northern part of the map. There are no rough patches, wadis, or any other elements that would slow an advance. Extensive grass provides some concealment, but in the area where battle is expected to be joined, there is nothing. The few hills on the Iraqi side do have a few "rough" spots, where AT guns will be placed. HMGs are placed somewhat behind the lines of infantry. With a 2,000m range, the HMGs and AAMGs should command the battlefield once American AFVs are knocked out. This is shaping up to be a bloodbath. 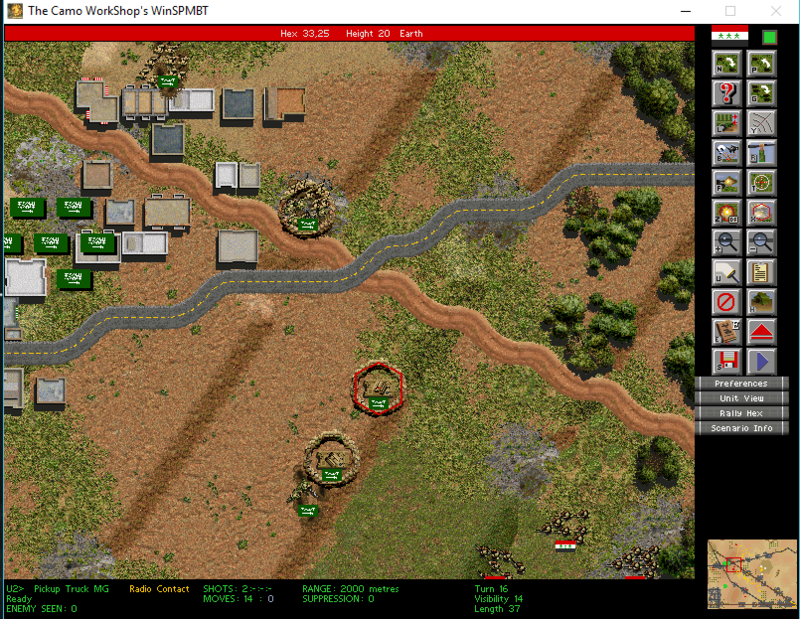 A platoon of Abrams tanks approaches in the southern sector. 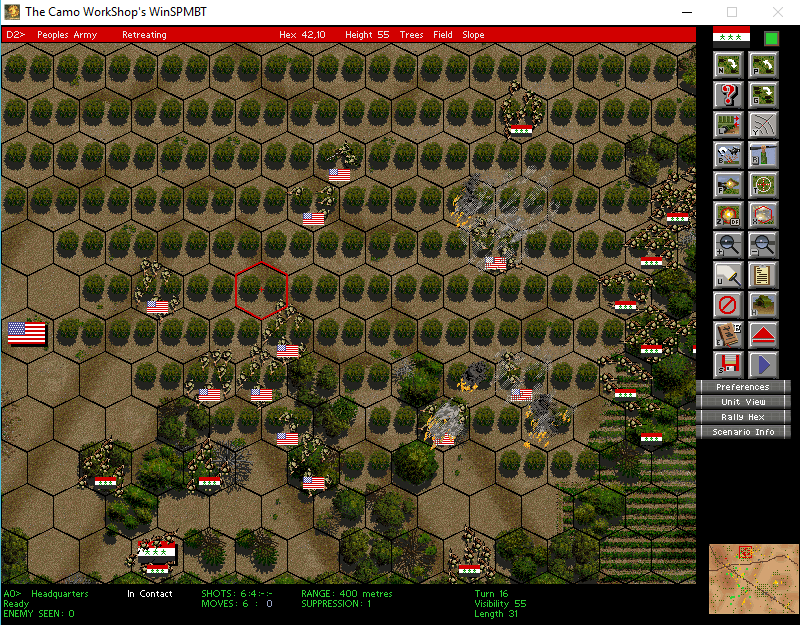 In this terrain, with this visibility, the key will be to knock them out quickly. The tanks advance on my objectives, instead of hanging back, even though from a distance of even 1,000m they would be effectively impervious to my return fire. Most of my troops have been given the order to cease fire (0m range). The southern ATG, however gets a rear shot on an Abrams, and takes it, successfully. 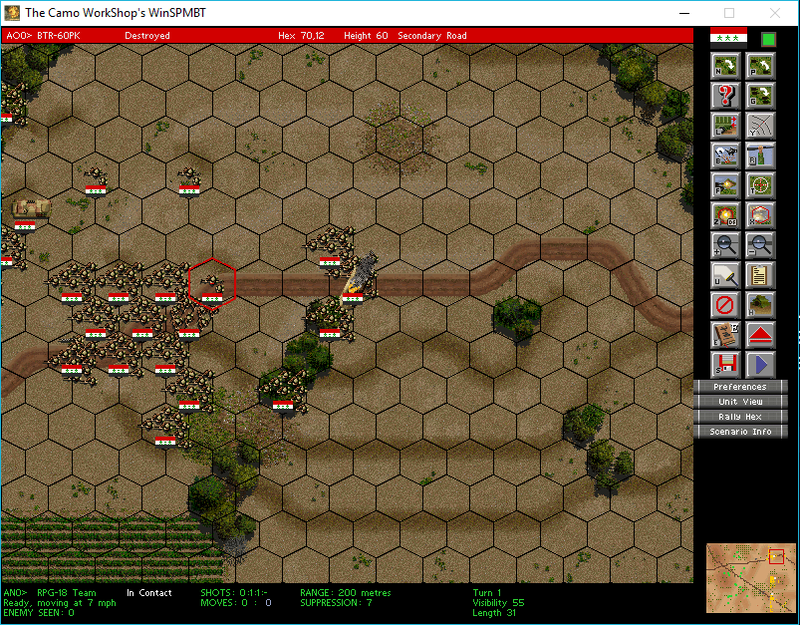 On the following turn the remaining tanks advance, and turn their flanks to the ATGs. Virtually without any return fire, each Abrams is knocked out by a side or rear shot from one of the ATGs. 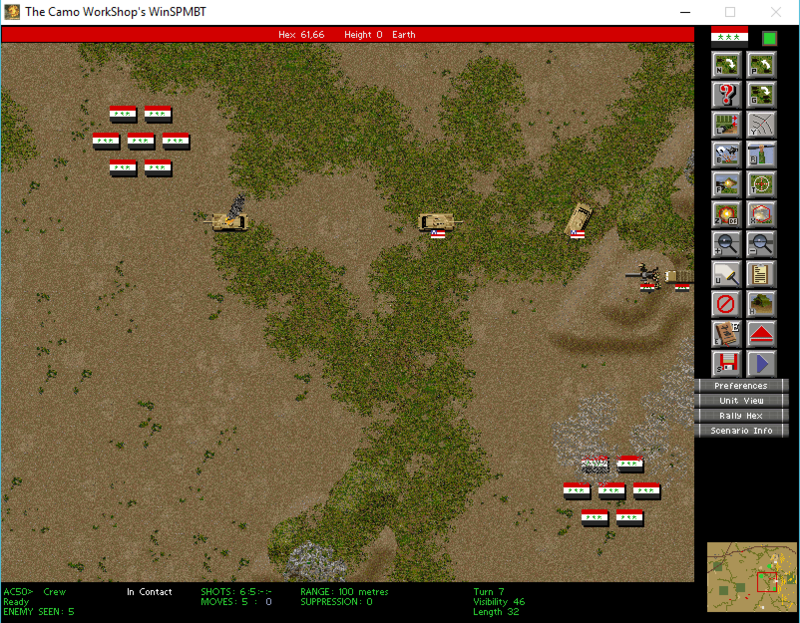 Colonel Mustafa, hidden in a forward position (where he can serve as FO), decides to take a shot at a retreating crew and earns his second kill. 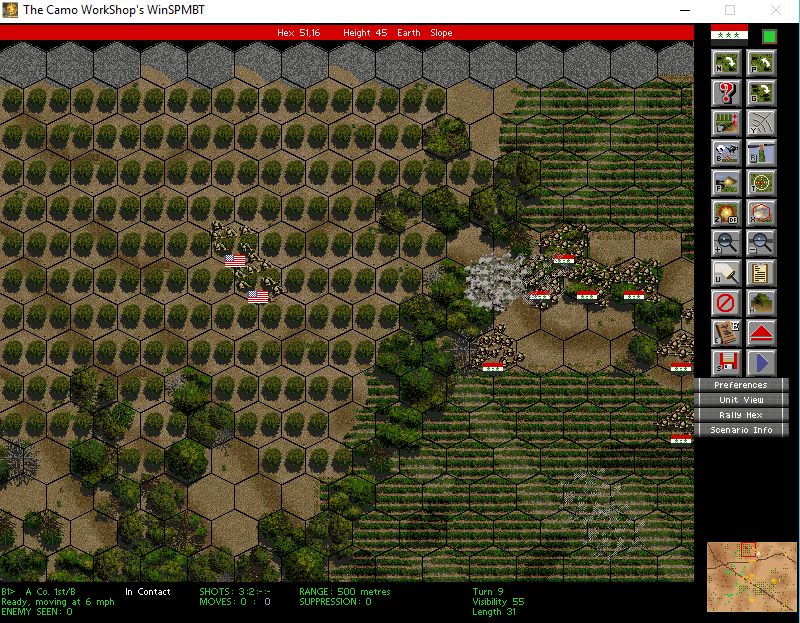 There are a couple of Vulcans approaching, but other than that, the American armor looks to be finished. Five more turns pass. The Americans clearly possess mortars and 105mm artillery, but these have not yet done any serious damage. American infantry has not appeared yet, either. One Vulcan is down. 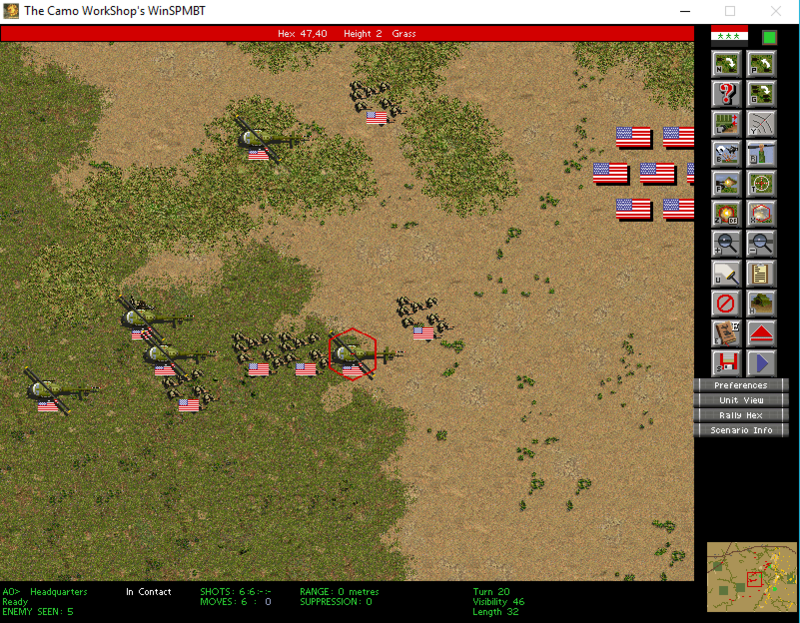 On turn 17 the American infantry finally arrives, and the bloodbath begins. 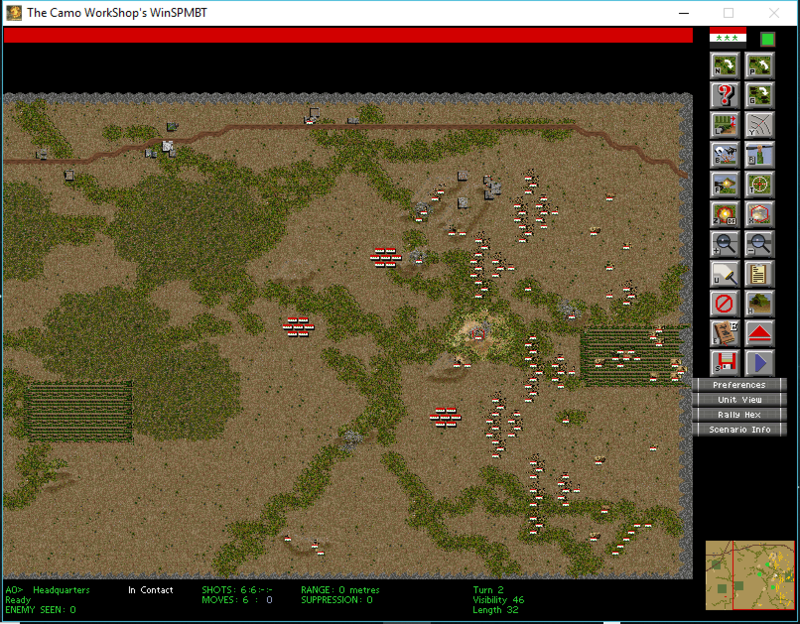 They are attacking in the northern half of the map, where there are a couple of hills that block the view of my support weapons considerably. Placing these weapons on the hills themselves would expose them too much. 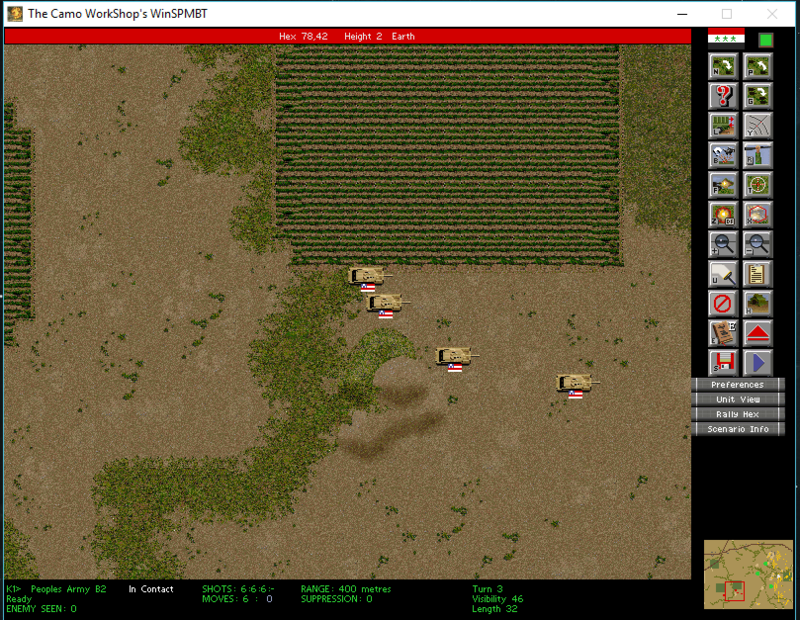 My infantry moves only slowly, because any fast movement attracts fire from as-yet unidentified American MMGs. There are also minor pushes in the center and southern half of the map, but these should not result in a breakthrough, as they are smaller, and my support weapons can target them easily. The final elements of the American attack arrive by helicopter. They do not attempt to penetrate the lines, or otherwise provide a tactical surprise, but just their appearance is very cool. My HMGs and AAMGs take a few potshots but don't score a hit. The arriving force is roughly a reinforced platoon. The following turns are simply a meatgrinder, where American forces are slowly whittled down, but any attempts to flank them are stymied by American MMGs. The northern attack had four MMGs concentrated right behind it, and more in the center. I do move some units in the north and south forward, but the MMGs can simply stop them with relative impunity. 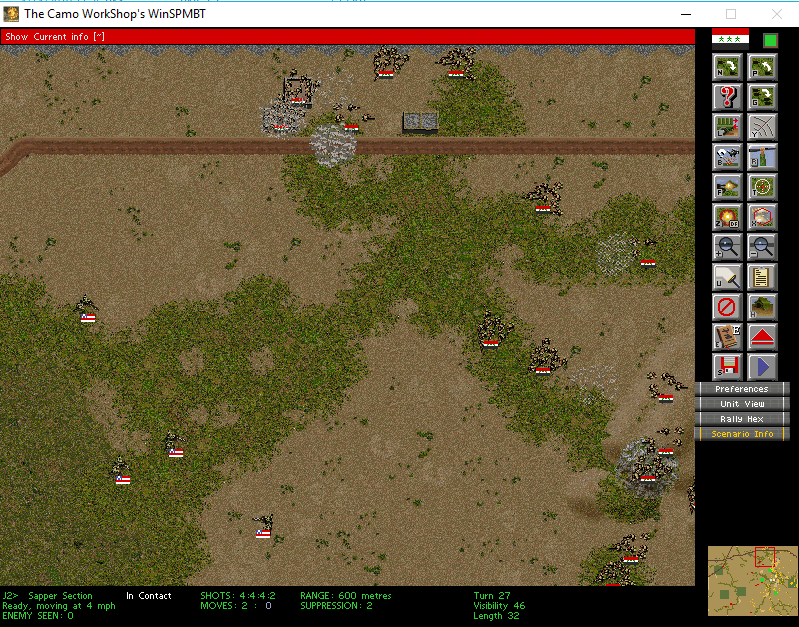 The American infantry captures some VPs, but it is clear they can only hold them for as long as the MMGs are providing cover fire. 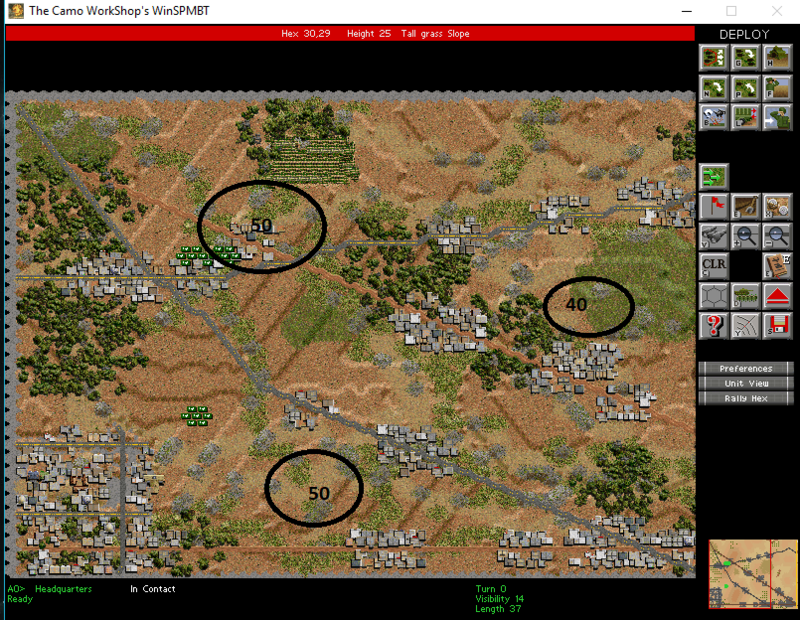 The U.S. 105mm artillery drops a few barrages that shred a number of my squads to below 50%. 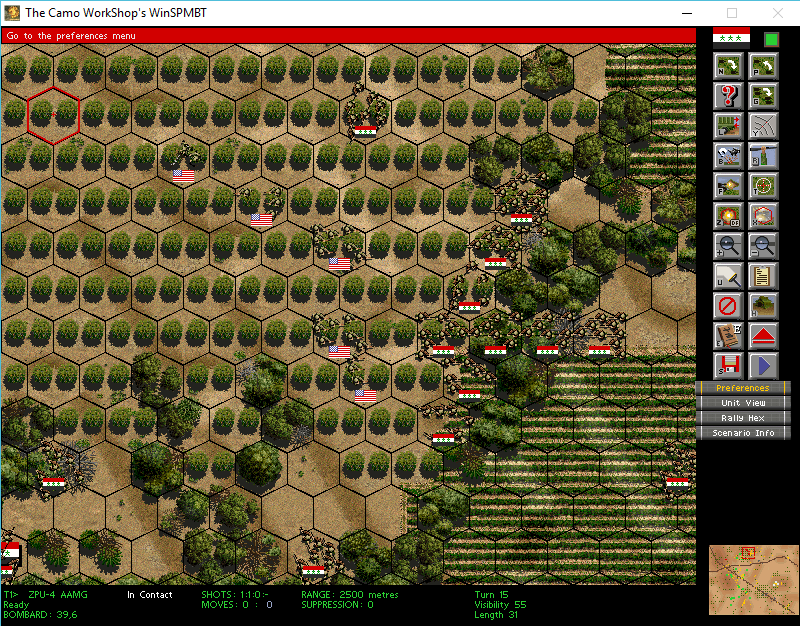 My infantry in the center moves only cautiously and tries to engage the Americans, because by now time is running short. Eventually, a simple smoke barrage blinds the US MMGs long enough for my infantry to close and defeat them. Without that support, the U.S. troops are defeated piecemeal, and all VPs recovered. 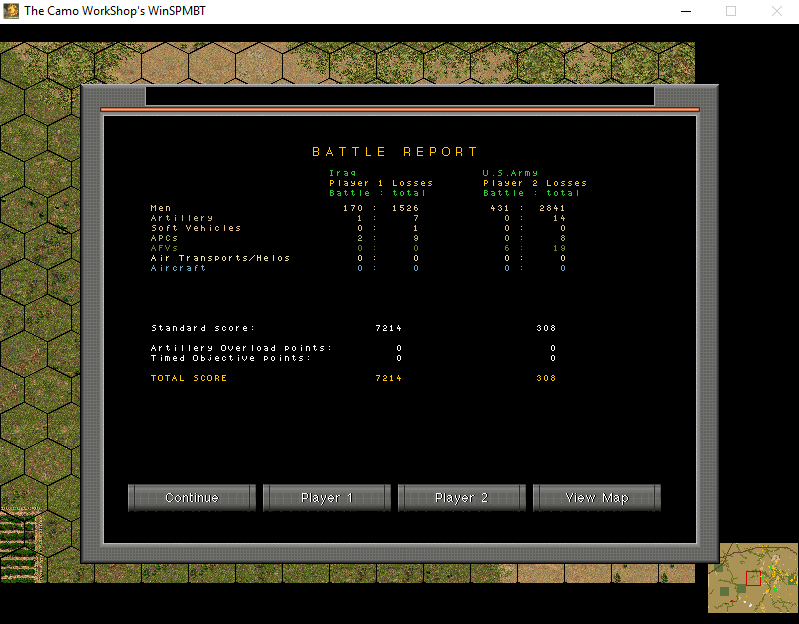 Decisive Victory results. Last edited by raginis; April 20th, 2019 at 12:10 AM..